Heading back to more familiar territory, the 1980’s, with one from “the vaults” of older caps. Always nice to be reminded what a truly spectacular decade that was. With any luck the fashion cycle will replay it sooner rather than later. I’m filing this under “television” and not film because it was a TV movie, and that “Furs on Television” category is looking a little anemic. From 1959 to 1963 there was a sitcom called The Many Loves of Dobie Gillis. 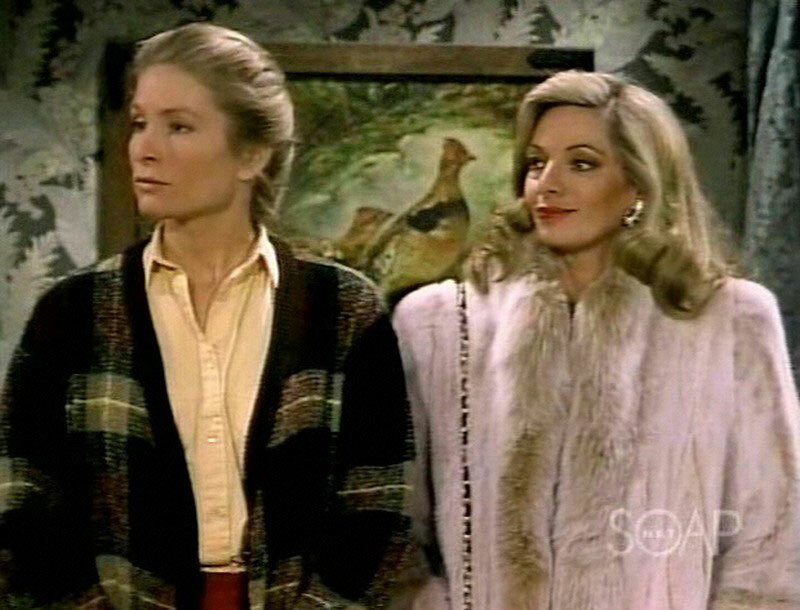 In so far as it wasn’t something I caught very often on the “nostalgia” networks (I was more a Green Acres man, Lisa Douglas FTW), I’m not very familiar with it. In 1988, before it showed up on Nick-At-Night, someone created a reunion movie. The film’s plot was lifted from a 1956 tragicomedy by Swiss dramatist Friedrich Dürrenmatt, as the IMDb’s film pundits are literally dying to tell you about. The upshot of which is an old girlfriend blows into town to snag Dobie away from his happy home life by bribing the economically down-on-its-luck town. 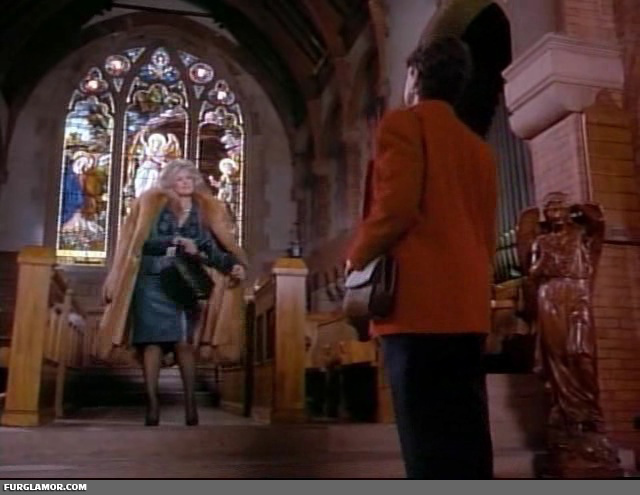 That old girlfriend is played by Connie Stevens, and her wardrobe was pure 1980’s rich lady. Yes, Connie, as Thalia Menninger, blows into town on Air Force One with her well stocked closet, and it’s brimming with fox. 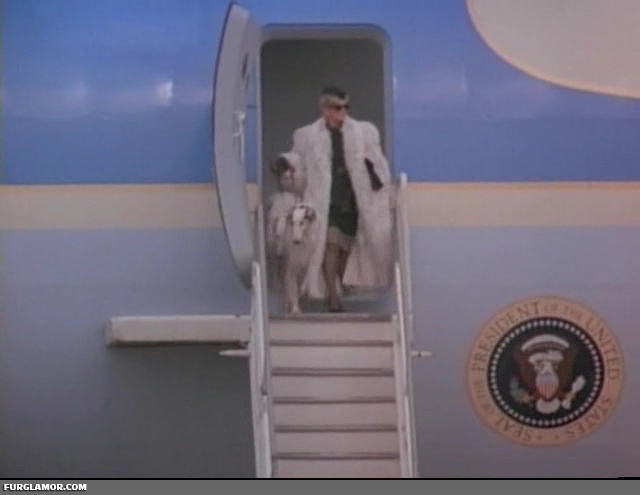 In “great entrance” territory, Connie walks off Air Force One wearing a full length lynx coat. Could be lynx dyed fox, either way, it’s a spectacular, thick ankle length fur. I “confess” to a deep adoration for brightly dyed fox. Though pink is a particular favorite, this one is quite nice indeed. I remain confused by Hollywood’s costume designers unceasing desire to break up such lovely muffs with metal broaches. This one is only slightly less annoying than the one in Lady of Burlesque. Next up there’s this large red fox, which is another magnificent specimen from the 80’s mega fox line. Not quite as long as her entrance fur, but quite the coat nonetheless. Connie does the “imperious” look while wearing the fox perfectly. Massively full pelts on this coat as well as we get a quick glimpse from behind. To wrap up we see a final red fox, different from the previous one as evidenced by the horizontal pattern of the pelts. This appears to be a very long cape, worn, while riding a horse, by Thalia in one of Dobie’s dream sequences. Basically, this is just one of the finer examples of why I really liked growing up during the 80’s. Sadly things got a little rough after that. If I had to nitpick, I’m afraid Miss Stevens, while lovely, may have been a little past her prime at this point in her career. I admit it was appropriate casting considering the show’s original air-date, but that would have been a great Morgan Fairchild role. Perhaps most tellingly, it would be a great role for 2009 Morgan Fairchild. Soap.net abandoned me a while back. I knew I was in trouble the minute I saw commercials for 90210 appearing. As I knew it would, the network’s line-up was slowly overtaken by 90’s soaps. With the exception of 60 minutes in the wee hours of the morning for Ryan’s Hope (more on that later), the network is devoid of any worthwhile programming. I was at the time coming off taping Dallas after having done Dynasty. All the while Knots Landing ran concurrently. I knew it was a long lasting show, and that my odds of it being replayed from the beginning were low, but I kept my focus on the big 2. So what I have of Knots runs from about season 3 until… well, until the 90’s happened and ruined fur on television. So there may be a few choice moments I missed, but this gallery represents most of the “decent” furs ever seen on the show. Knots Landing was adapted as a Dallas spin-off, about a cul-de-sac in the LA burbs of the same name. Climate wise, it was no Denver, and wardrobe wise it wasn’t either. 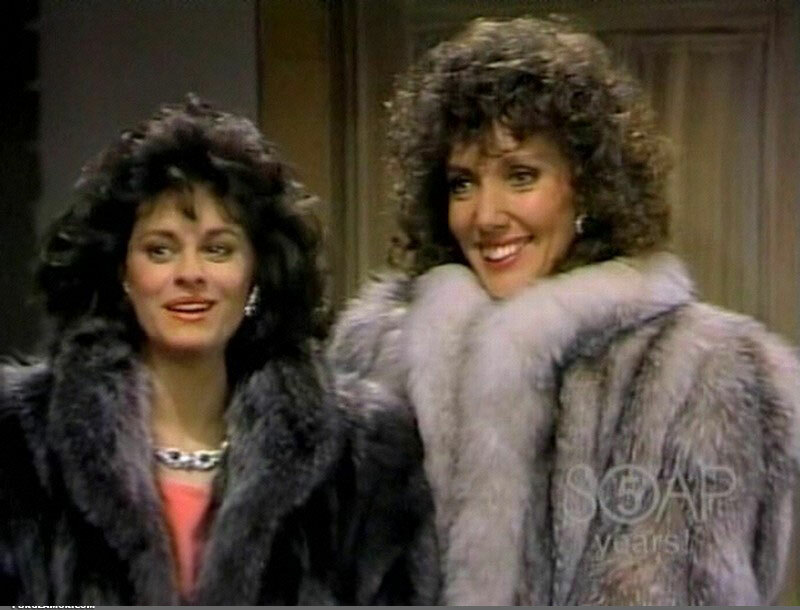 Still, as an 80’s nighttime soap, the humble residents of this particular suburban cul-de-sac did wrap up very glamorously from time to time, lead mostly by Donna Mills who arrived in season 2 to pump up the fur count much like Joan Collins in Dynasty. 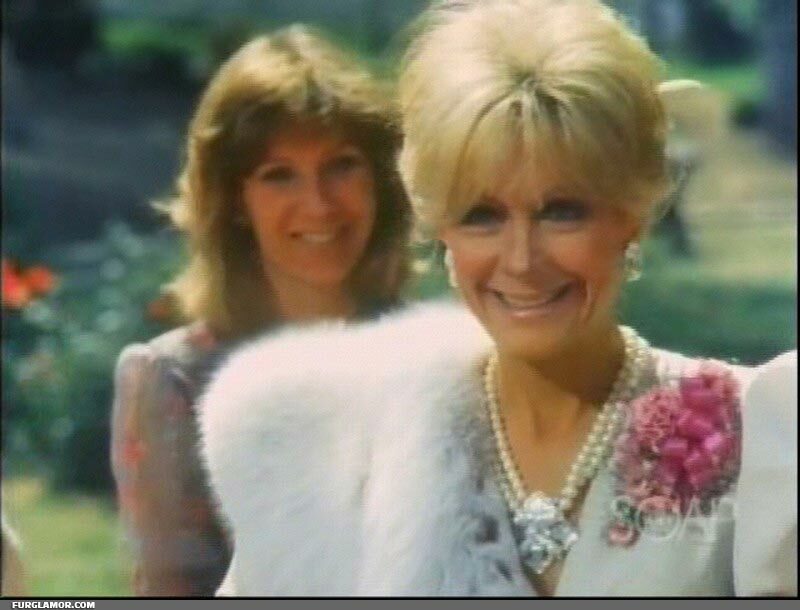 …and Constance McCashin in crystal fox. 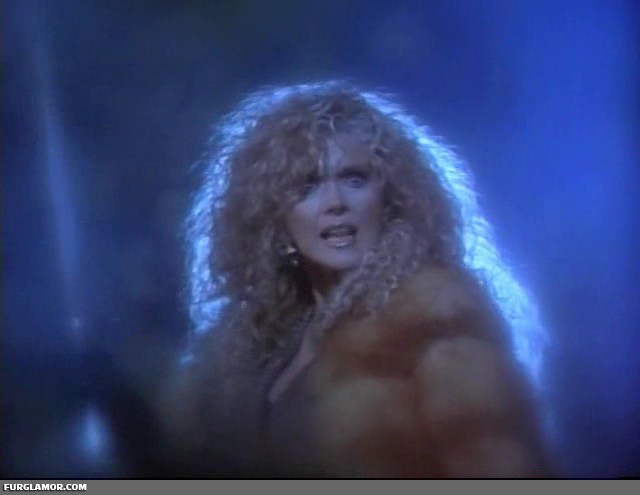 Joan Van Ark’s character was central to the show, and since she wasn’t meant to be a member of the gliteratti, she rarely ended up in fur. This hurt Knots’ overall fur quotient. 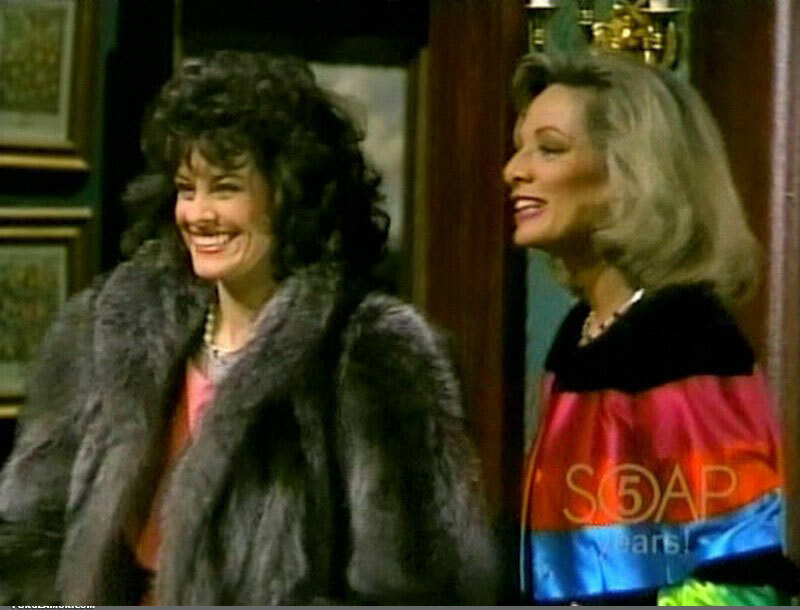 Where as Dynasty’s female cast seemed to compete to wear the most, outside of Abby, the pickings on Knots were slim. Here’s Val in a rare red fox coat. 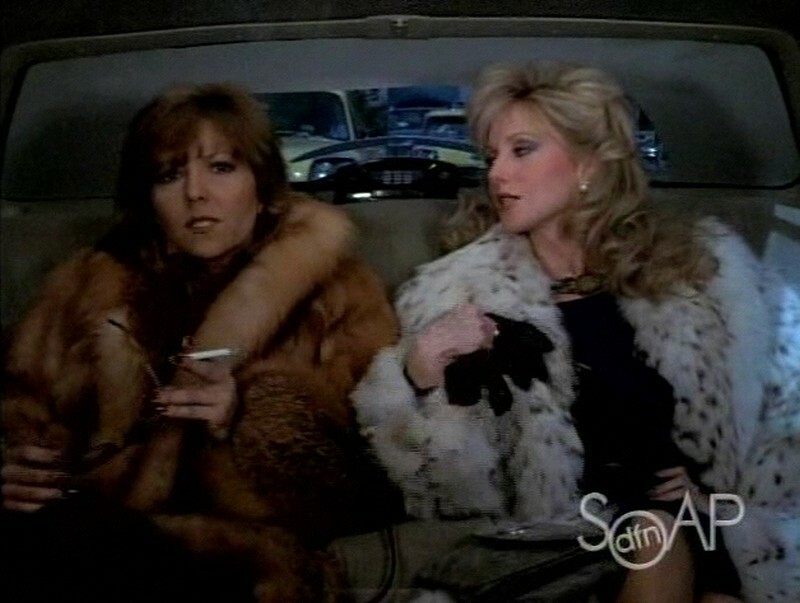 To say Donna’s character Abby got the best furs is a bit unfair, since she got the most, but Constance McCashin’s Laura Sumner did have some memorable ones, especially this large lynx fur coat. Val’s “other” notable fur was another stole, this one in white fox. Michele Lee’s character Karen was in the same boat as Val, a regular ole housewife who wasn’t supposed to look glamorous. Thus she rarely got any fur. This black fox stole was one of her only notable appearances on the show wearing fur. Back to the really good stuff, with Abby wearing a big full length blue fox coat while engaging in what is no doubt completely innocent chit-chat with a shirtless male. It does appear he’s happy to see her like that, though. Getting later into the show the furs became very few and far between. Fortunately when they did appear, they were worth it. 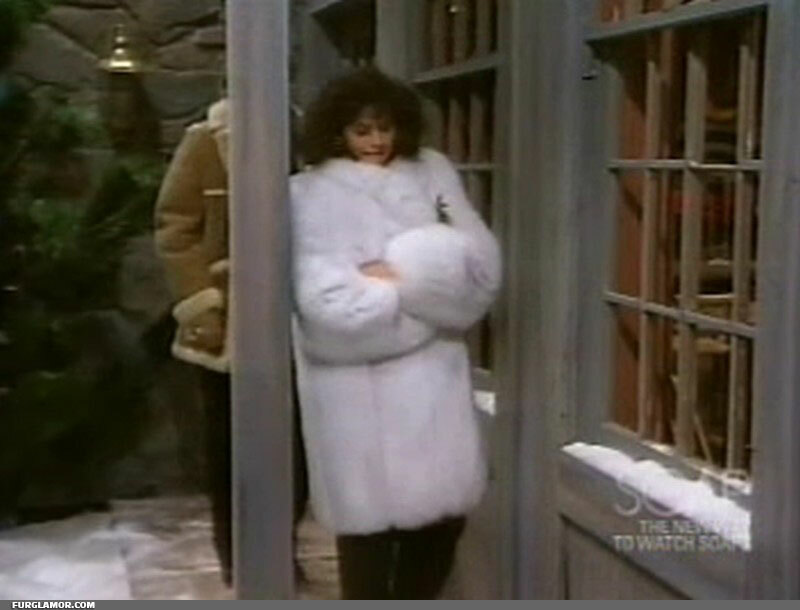 Here’s Donna Mills in lovely full length lynx fur coat. Here’s a perfect illustration of why I generally don’t bother capture mink images in any form. 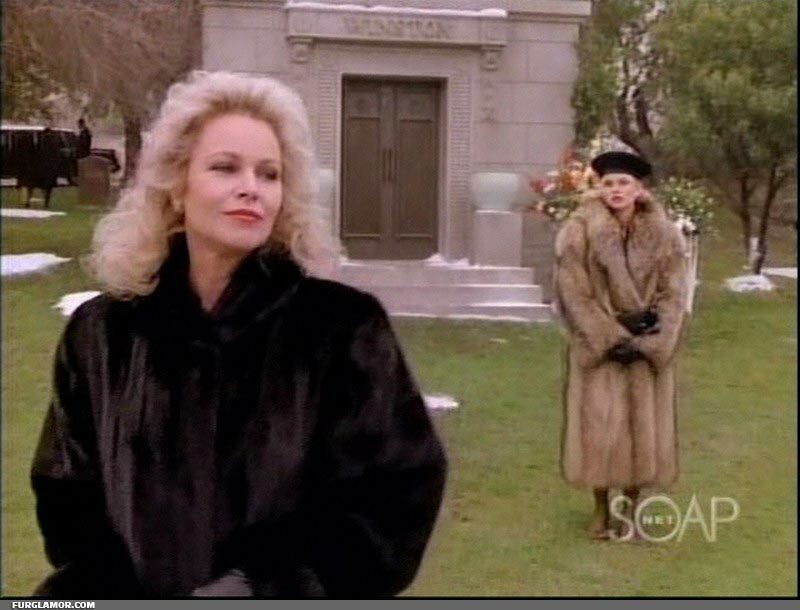 This is Michelle Phillips in a full length black mink playing Nicollette’s character’s mother, with daughter Paige in the background. To me, there’s no contest. Nicollete’s huge, thick, full length beauty screams youth and passion, fire and energy with more than a hit of sensuality. Michelle might as well be going to church. 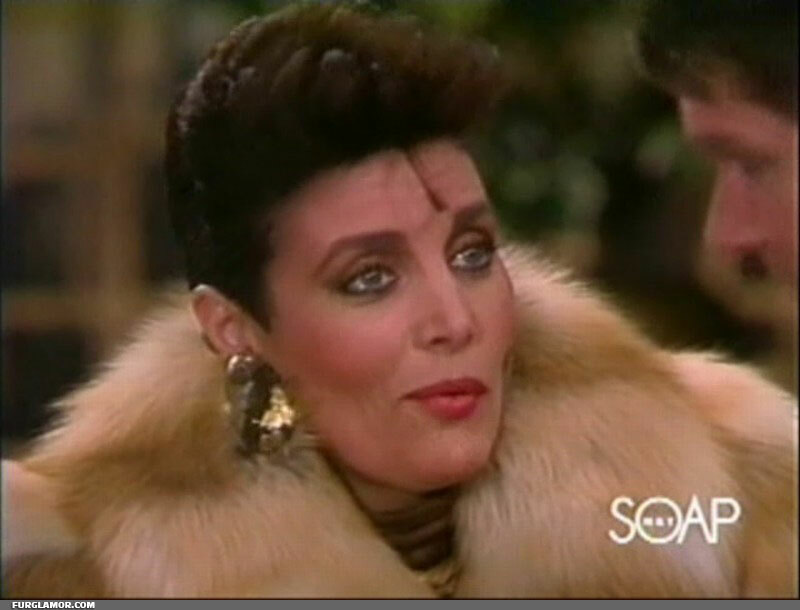 Of the big 80’s nighttime soaps, Knots was certainly the poor cousin to Dallas and Dynasty in the fur department. The core problem was the setting and characters, most of whom weren’t ever meant to be quite as “flashy.” They were housewives living on a suburban cul-de-sac. Probably should be happy the overall 80’s aesthetic blended as much fur into the show as it did. Comparatively, they’ve certainly run a higher fur-per-episode count than similarly themed Desperate Housewives. Oh, what a difference a couple decades make. Like ships passing in the night, SoapNet’s programming schedule and my best days of capping were not destined to meet up at the appropriate time. Those early days of a schedule permeated with 80’s nighttimes soaps did help hone my skills. Unfortunately they weren’t what they are today. This doesn’t mean I don’t have a large back catalog from that time that, by virtue of the fact it will probably never be updated, I’ll throw out from time to time. The Paper Dolls gallery was one such example. Between about 2003 and 2007, SoapNet showed Another World. Only somewhat fortunately, they decided to start showing episodes starting from 1987. 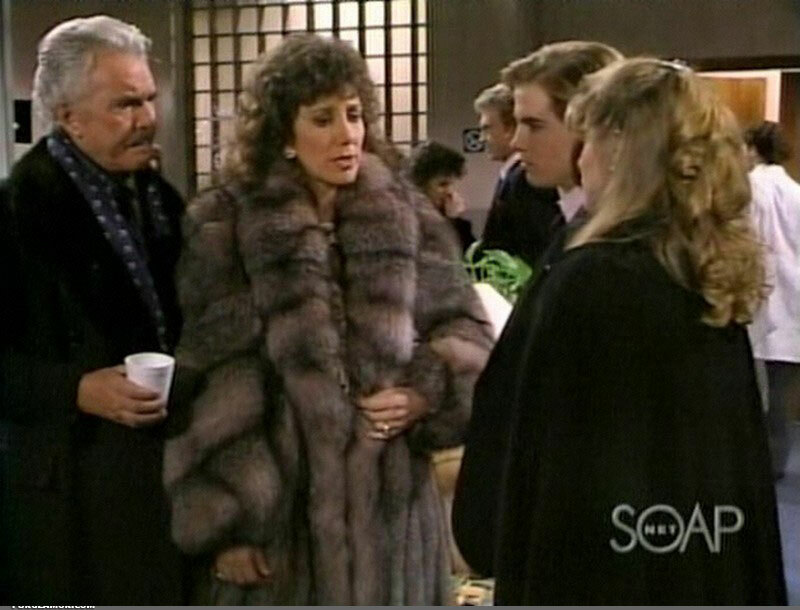 That provided a decent couple years before the combination of a waning fashion cycle propelled by a changing cultural zeitgeist that would make the 1990’s a barren wasteland of televised fur fashion from which we still have not completely recovered. Another World ran from 1964 to 1999, I’d have preferred SoapNet pick out something around 1975 to 1990, but I have to accept what I get, and it wasn’t bad, as the caps will prove. Like anything that lasted upwards of 30 years, the details are long and complex, so I’ll skip trying to fill in the plot and get to what we’re here for…. These are in roughly chronological order in the sequence the episodes were shown in. I can’t place a fur to an episode name or number at this point. In the few years they showed Another World, I grabbed good shots from only about 17 episodes, a very tiny fraction compared to shows like Dynasty. Again, the fact that any of these beauties showed up on television so close to the 90’s was blessing enough. Starting here with the recognizable member of the cast, a very young Anne Heche wearing a perfect example of a “mega fox,” this one crystal flavor. Youthful Miss Heche wears it very well. Moving to another great white fox stroller on actress Joanna Going. The sleeves of the stroller are exceptionally full here. 80’s hair and 80’s fox on this lady. I think her hair manages to be fuller than the fox fur coat, which is actually quite an accomplishment. Linda Dano, “Felicia,” wearing a huge power fox, golden isle flavor. If Another World was showing furs like this so late in the game, I certainly wonder what amazing ones I missed through the 80’s. Wide shot lacks a little detail due to the low data rates I worked with back then, unfortunately, but this one deserves a second look to show the sheer size of the full length fox beauty. Joanna Going in a shorter haired mink or marten. Though I usually pass on “documenting” the less full furs, the brighter colors of one like this can make it worthy of notice. Anne returns in another mega fox, this one blue. She looks equally at home in this as the previous crystal fox. Nice close up of Anne Heche in the blue fox power fur. Not sure who this blond is, though she is appropriately outfitted in the kind of big fox coat that reminds me why I miss the 80’s. Carmen Duncan playing Iris in a blush fox trimmed blush mink jacket. Joanna Going is back for a Christmas episode in this big white fox wrap. Christmas was always a giving time of season back then. Linda Dano in an interesting and rather tall fur pillbox hat. Should have “accessorized” with a giant white fox coat, but time was growing short for fur at all on Another World at this point. All wasn’t completely gone, though, as series mainstay Victoria Wyndham appears in yet another full length power fox. 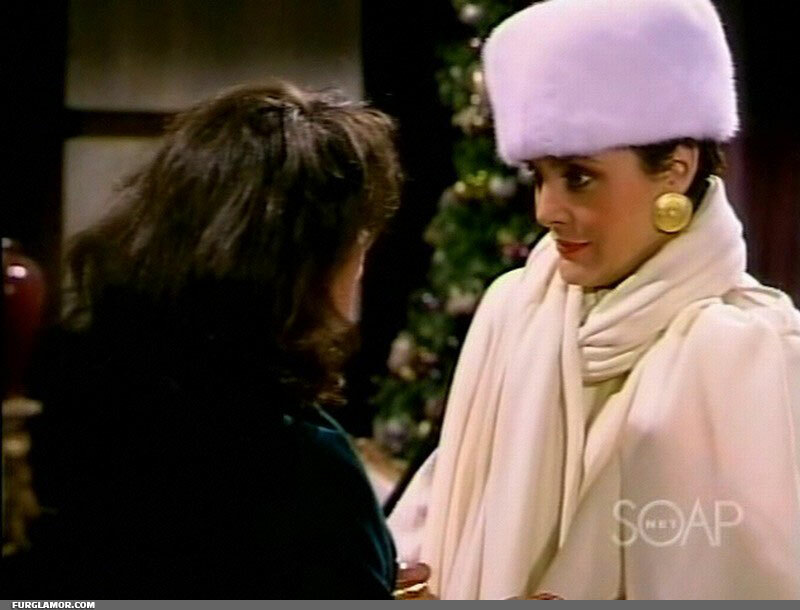 Though not on the show for more than a few years, Joanna Going racked up an impressive score, appearing here in a very full silver fox stroller coat. And with Miss Wyndham in this set, which is a pretty much where Another World‘s wardrobe department basically gave up against the unrelenting tide of the 90s. Granted, this was a very fine pair to go out on. Here’s the full gallery, biggest one yet at 40 pics: Another World Fur Gallery. Now that John Greenleaf Whittier is spinning in his grave over the use of that rather brilliant turn of phrase on a blog, we can move on to talk about Paper Dolls. From September to December of 1984, ABC attempted to duplicate the Dynasty gravy train with another high-society evening soap. The setting, high fashion modeling. The year 1984. In summation: major fur glamor. 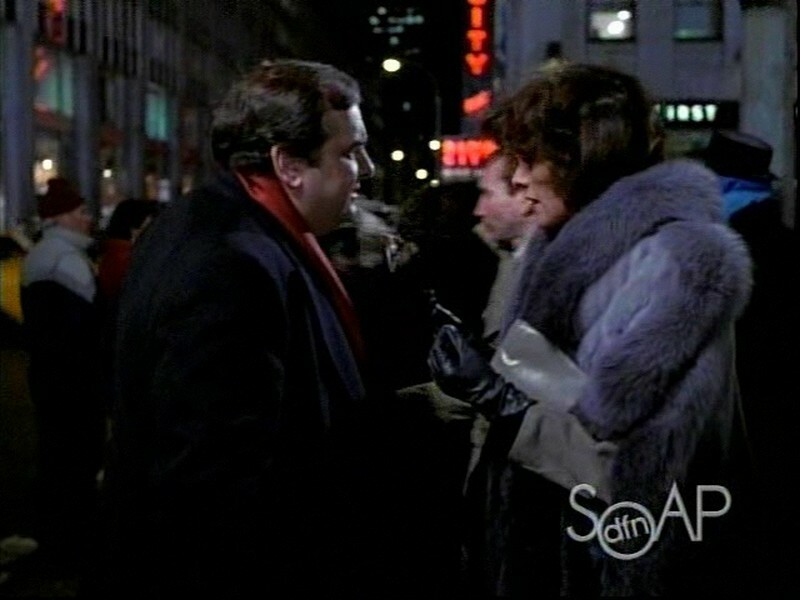 Sadly, this 80’s fur-fueled epic was not to last, stripping posterity of years of glamorous stars in enormous fox coats. We have only our fantasies to guide us about what the years to come may have brought. All that remains are 14 all-to-brief episodes of fur glory. 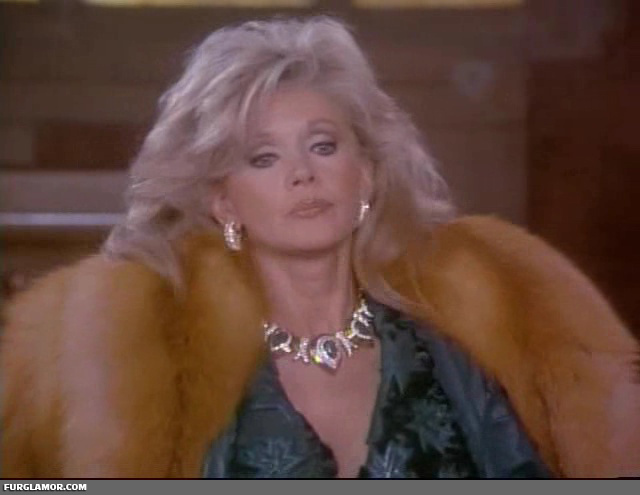 …comes out swinging on cold days and nights, forcing one of the last of the great 80’s fur stars, Morgan Fairchild, to do what she does best, look awesome in a big fur coat. 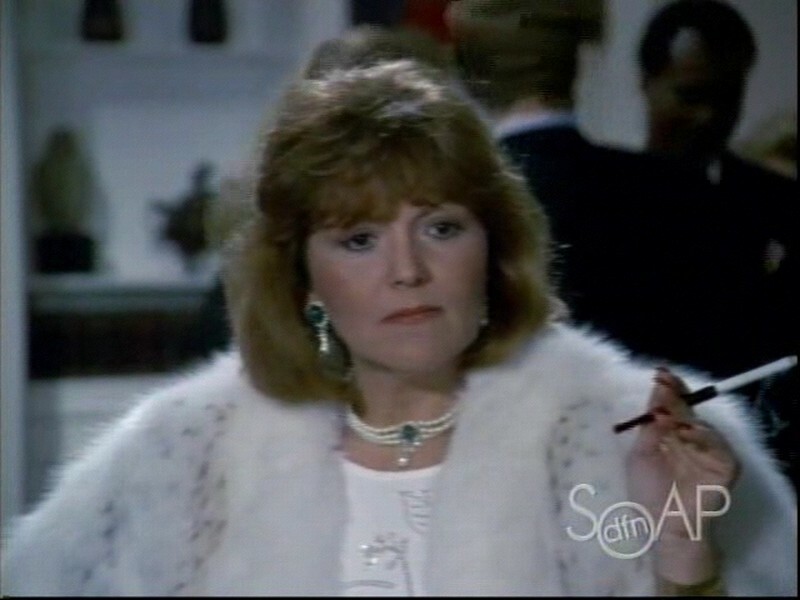 One might quibble over Brenda Vaccaro and how she went a bit downhill so many years after Midnight Cowboy, but I have to look on the bright side and think, it could have been worse. Who else should appear but a very young Mimi Rogers, pimping a very nice full length lynx. Paper Dolls obviously had a budget behind it. I would have been happy with just “foxes of many colors”, but you can’t complain about tossing in some high end lynx. Speaking of very young, Nicollette Sheridan made her acting debut on Paper Dolls. 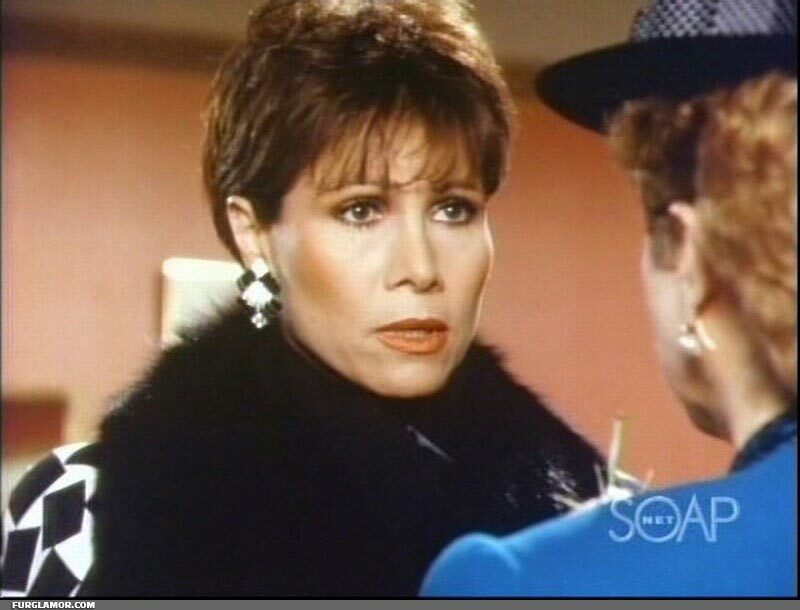 She’d later bring the fur in Knots Landing and ever so briefly in Desperate Housewives later, but this was her start, and what a start it was. 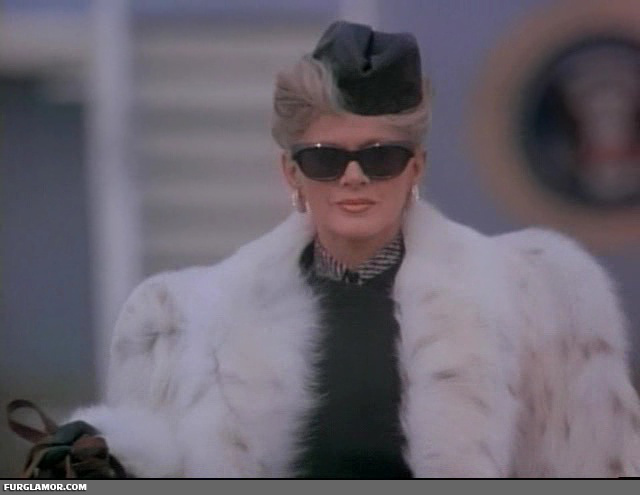 Perhaps if the show had lasted she’d have made fox coats all the rage with the teenage set. Making sure she covers her fundamentals, Nicollette gets some red fox time in as well. Sadly, she did not get a chance to wrap up in some blue fox before the show’s so premature departure. Granted, given the choice, I’m kind of glad if there had to be only 1 of the two that wore furs more often, it was Nicollette. This isn’t to say if Dax had been walking around Deep Space Nine in enormous fox coats all the time, I would have minded. Just a few extras, as it’s not like I don’t have a lot of them. Here’s Morgan Fairchild in what appears to be stone martin, or maybe just a pleasantly colored mink. I enjoyed the juxtaposition of Morgan’s teased out blond on top and the fur on the bottom. I think this is Jennifer Warren in a nice dyed fox. Love the dyed foxes, though my preferences run more towards hot pink than purple. 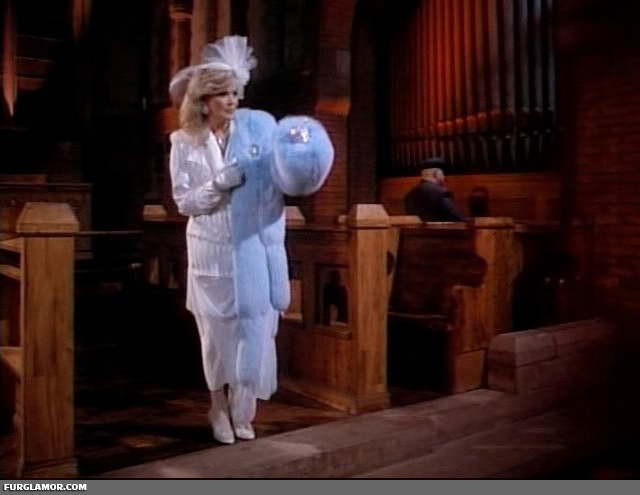 The interesting thing about this one is that it’s very similar to the coat that shows up in an episode of Dallas. Same alternate sleeve dyes and all. Brenda going for extra points with the cigarette holder here. Smoking, good, cigarette holders, awesome. And that’s it for Paper Dolls. This isn’t all the fur there was on the show, even. It displayed so much potential, only to be cut down before it could amass a good 100 episodes of massive fox coats. Sadly, prior to mass Internet connectivity, there was no grass roots campaign to bring the show back.